I was hoping to hear a report on Doug and Gary playing at the NTSGA on their diatonic tuning. If anybody was there please tell us about it. They will also be playing at the GSGA show here in INDY on May 4th and 5th. I'm not sure which day but they are going to give it a try. Come and be with us and you can no doubt ask them questions about the tuning. Our concert info can be found at www.gospelsteel.com. Danny, is that a pedal or a non-pedal guitar tuning? I've never heard of it before. I must be living too sheltered a life! I need to get out more! This is a special setup and tuning developed by Doug Jernigan and Gary Adams which is being used on a 12 string pedal steel guitar. This is something that Doug and Gary have been working on for some time now, and is very unique. I haven't gotten all of the details about it yet, but I'll talk to Doug about it the next time I see him, and see if I can get more details to pass along to the interested parties here. That's what it look like to me too! And on Fessenden guitars. The opening in the changer end looks larger than standard, has Jerry went to a quad raise changer maybe? Gary's guitar has more pedals. I want that one. I want to hear a clip. the cat scared the pants of me. DLD, Chili farmer. Plus bananas and papaya too. Real happiness has no strings attached. But pedal steels have many! Always up for hearing about new tunings especially if its something these two are pursuing, it has to be pretty capable of Jazz and I would think country too. Is this the first time this tuning has come up on the forum? Hopefully someone will post a pedal chart in the near furture? Thanks for all the input and John...great photo, Thanks! I believe in the near future someone witll post the pedal setup for the diatonic tuning. This is the kind of steel guitar buzz that has always gotten my wheels turning. Can't wait to hear some examples! 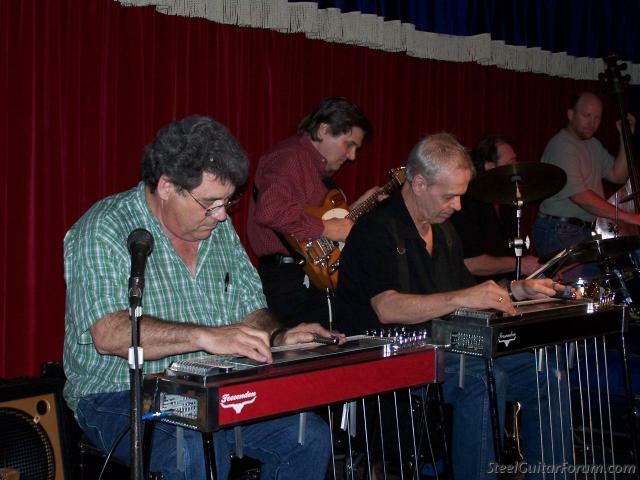 Hey guys Gary had this guitar at one of my Gospel Steel Guitar Shows and everyone was watching and listening . It was very interesting to say the least ! G.P. Yes! I remember he was there year before last. 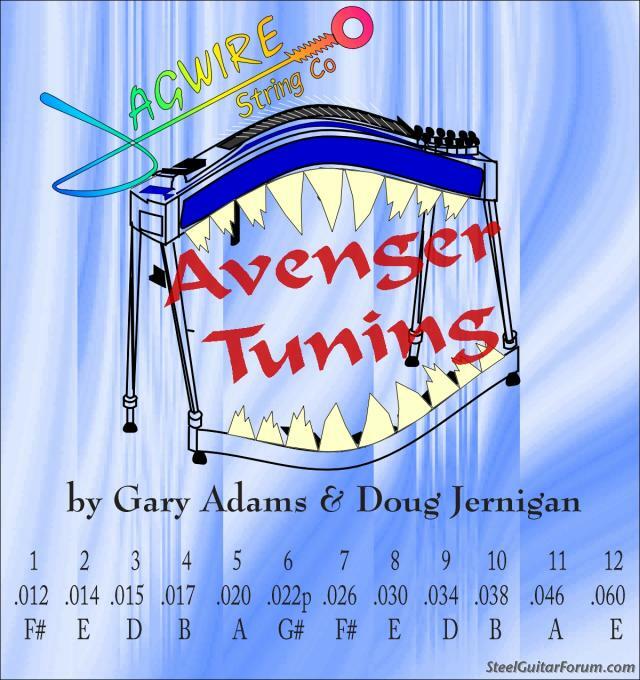 Is this tuning really avenging anything? What's the copedent? This looks really interesting. Thanks for your interest in the avenger tuning. Gary and I came up with this tuning approximately 36 years ago while we were working with Johnny Paycheck. We are still experimenting with the pedal and knee lever setup. I will post the copedent shortly after we finalize it. I will say the tuning lends itself to 7 or 8 knee levers and hopefully 5 foot pedals. About half of the knee levers will be split tuned. Gary and I hope to have a CD out for ST Louis showcasing the tuning. Bump for the ISGC input. I would think any time a player of Jernigan's caliber proposes a new tuning idea it would generate more interest.